Download "SECTION 560 COATING NEW STRUCTURAL STEEL"
1 560 COATING NEW STRUCTURAL STEEL. (REV ) (FA ) (7-13) SECTION 560 COATING NEW STRUCTURAL STEEL Description Coat new structural steel in accordance with the requirements of this Section. 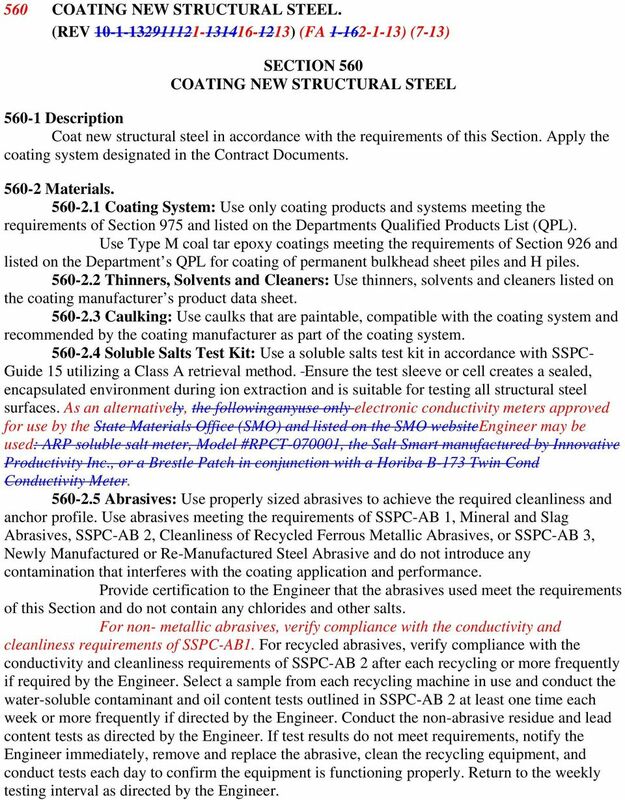 Apply the coating system designated in the Contract Documents Materials Coating System: Use only coating products and systems meeting the requirements of Section 975 and listed on the Departments Qualified Products List (QPL). Use Type M coal tar epoxy coatings meeting the requirements of Section 926 and listed on the Department s QPL for coating of permanent bulkhead sheet piles and H piles Thinners, Solvents and Cleaners: Use thinners, solvents and cleaners listed on the coating manufacturer s product data sheet Caulking: Use caulks that are paintable, compatible with the coating system and recommended by the coating manufacturer as part of the coating system Soluble Salts Test Kit: Use a soluble salts test kit in accordance with SSPC- Guide 15 utilizing a Class A retrieval method. Ensure the test sleeve or cell creates a sealed, encapsulated environment during ion extraction and is suitable for testing all structural steel surfaces. As an alternatively, the followinganyuse only electronic conductivity meters approved for use by the State Materials Office (SMO) and listed on the SMO websiteengineer may be used: ARP soluble salt meter, Model #RPCT , the Salt Smart manufactured by Innovative Productivity Inc., or a Brestle Patch in conjunction with a Horiba B-173 Twin Cond Conductivity Meter Abrasives: Use properly sized abrasives to achieve the required cleanliness and anchor profile. Use abrasives meeting the requirements of SSPC-AB 1, Mineral and Slag Abrasives, SSPC-AB 2, Cleanliness of Recycled Ferrous Metallic Abrasives, or SSPC-AB 3, Newly Manufactured or Re-Manufactured Steel Abrasive and do not introduce any contamination that interferes with the coating application and performance. Provide certification to the Engineer that the abrasives used meet the requirements of this Section and do not contain any chlorides and other salts. For non- metallic abrasives, verify compliance with the conductivity and cleanliness requirements of SSPC-AB1. For recycled abrasives, verify compliance with the conductivity and cleanliness requirements of SSPC-AB 2 after each recycling or more frequently if required by the Engineer. Select a sample from each recycling machine in use and conduct the water-soluble contaminant and oil content tests outlined in SSPC-AB 2 at least one time each week or more frequently if directed by the Engineer. Conduct the non-abrasive residue and lead content tests as directed by the Engineer. If test results do not meet requirements, notify the Engineer immediately, remove and replace the abrasive, clean the recycling equipment, and conduct tests each day to confirm the equipment is functioning properly. Return to the weekly testing interval as directed by the Engineer. 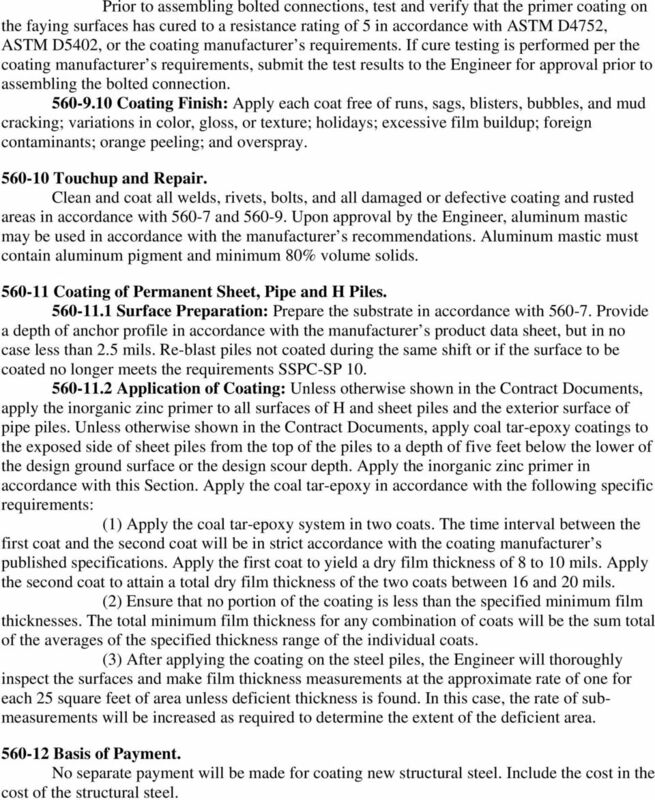 5 relative humidity, dew point temperature, or temperature of the steel is outside limits of the coating manufacturer s product data sheet Sealing Using Caulk: Apply caulk after the intermediate coat has fully cured to a condition suitable for recoating in accordance with the manufacturer s product data sheet, and before application of the finish coat. Completely seal the perimeter of all faying surfaces, cracks and crevices, joints open less than 1/2 inch, and skip-welded joints using caulk. Apply the caulk to the joint following the caulk manufacturer s recommendations. Ensure the caulk bead has a smooth and uniform finish and is cured according to the caulk manufacturer s recommendation curing schedule prior to the application of the finish coating system. It is unnecessary to caulk cracks and crevices less than 3 thousandths of an0.003 inches in width, located on the interior surface area of box girders Protection of Adjacent Surfaces: Protect all surfaces and working mechanisms not intended to be coated during the application of coatings. Clean surfaces that have been contaminated with coatings until all traces of the coating have been removed. 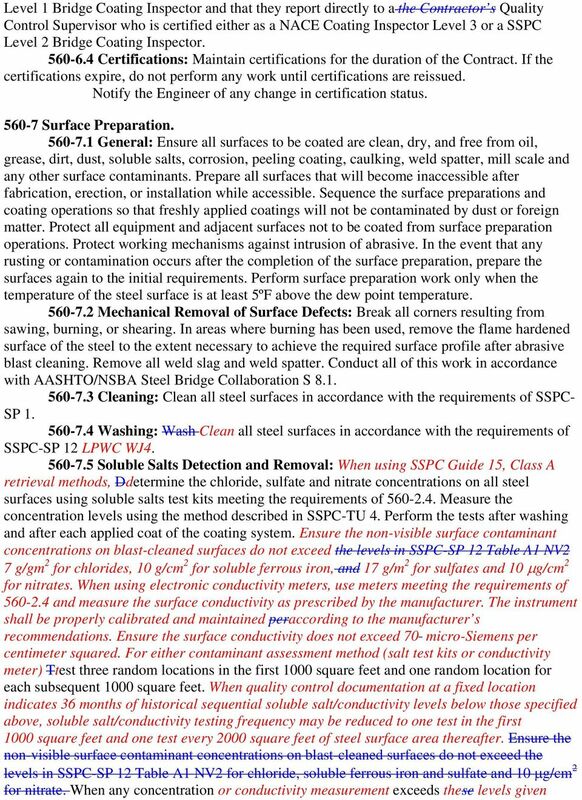 Do not allow material from cleaning and coating operations to be dispersed outside the work site Mixing and Thinning: Mix all coatings in accordance with the manufacturer s product data sheet. Only mix complete kits. Use thinners and solvents in accordance with the requirements of the coating manufacturer s product data sheet and confirm that the amount of thinner added does not result in the coating exceeding VOC regulations stated in Section 975. 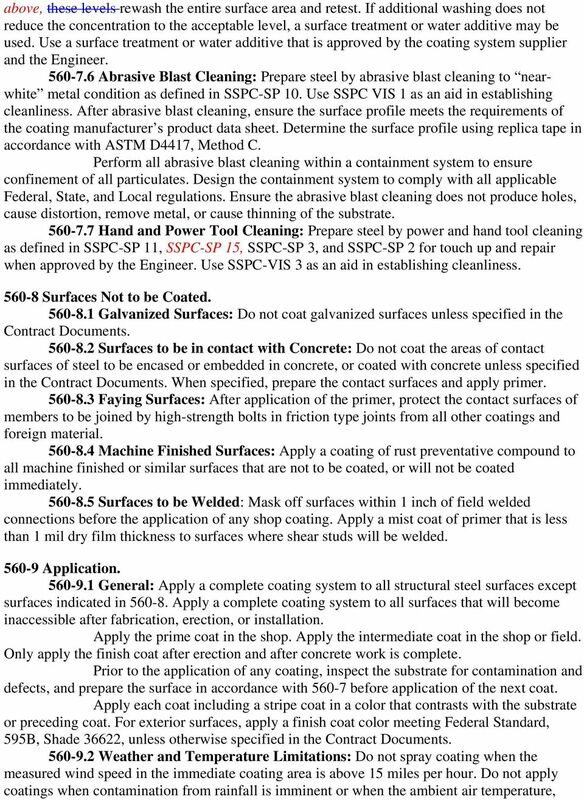 Perform all mixing operations over an impervious surface with provisions to prevent runoff to grade of any spilled material Application Methods: Use coating application equipment and apply coatings per the coating manufacturer s product data sheet. Application with brushes may be permitted for minor touchup of spray applications, stripe coats, or when otherwise approved by the Engineer. Adjust spray equipment to produce an even, wet coat with minimum overspray. Apply coatings in even, parallel passes, overlapping 50 percent. Agitate coatings during application as required by the coating manufacturer s product data sheet Stripe Coating: Apply stripe coats for both intermediate and finish coats to achieve complete coverage and proper thickness on welds, corners, crevices, sharp edges, bolts, nuts, rivets, and rough or pitted surfaces. A stripe coat of clear coating is not required. 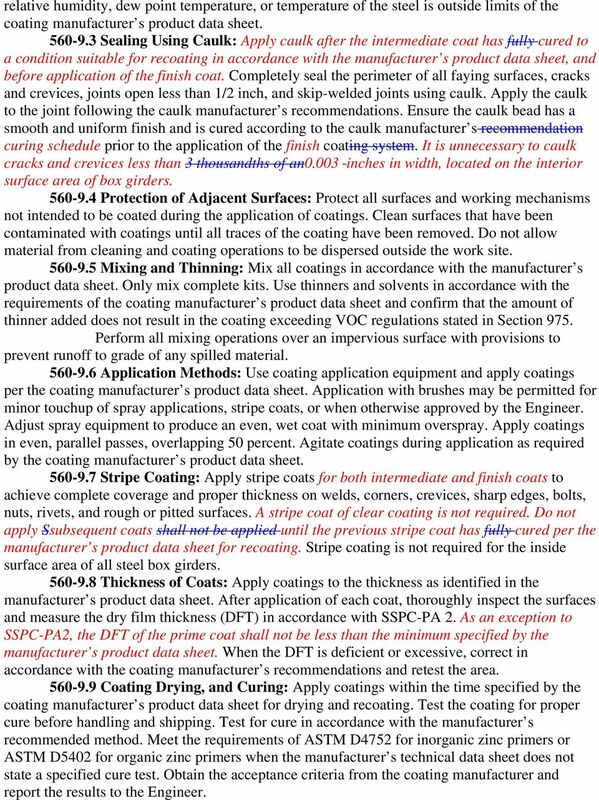 Do not apply Ssubsequent coats shall not be applied until the previous stripe coat has fully cured per the manufacturer s product data sheet for recoating. Stripe coating is not required for the inside surface area of all steel box girders Thickness of Coats: Apply coatings to the thickness as identified in the manufacturer s product data sheet. After application of each coat, thoroughly inspect the surfaces and measure the dry film thickness (DFT) in accordance with SSPC-PA 2. As an exception to SSPC-PA2, the DFT of the prime coat shall not be less than the minimum specified by the manufacturer s product data sheet. When the DFT is deficient or excessive, correct in accordance with the coating manufacturer s recommendations and retest the area Coating Drying, and Curing: Apply coatings within the time specified by the coating manufacturer s product data sheet for drying and recoating. Test the coating for proper cure before handling and shipping. Test for cure in accordance with the manufacturer s recommended method. Meet the requirements of ASTM D4752 for inorganic zinc primers or ASTM D5402 for organic zinc primers when the manufacturer s technical data sheet does not state a specified cure test. Obtain the acceptance criteria from the coating manufacturer and report the results to the Engineer. 6 Prior to assembling bolted connections, test and verify that the primer coating on the faying surfaces has cured to a resistance rating of 5 in accordance with ASTM D4752, ASTM D5402, or the coating manufacturer s requirements. If cure testing is performed per the coating manufacturer s requirements, submit the test results to the Engineer for approval prior to assembling the bolted connection Coating Finish: Apply each coat free of runs, sags, blisters, bubbles, and mud cracking; variations in color, gloss, or texture; holidays; excessive film buildup; foreign contaminants; orange peeling; and overspray Touchup and Repair. Clean and coat all welds, rivets, bolts, and all damaged or defective coating and rusted areas in accordance with and Upon approval by the Engineer, aluminum mastic may be used in accordance with the manufacturer s recommendations. Aluminum mastic must contain aluminum pigment and minimum 80% volume solids Coating of Permanent Sheet, Pipe and H Piles Surface Preparation: Prepare the substrate in accordance with Provide a depth of anchor profile in accordance with the manufacturer s product data sheet, but in no case less than 2.5 mils. Re-blast piles not coated during the same shift or if the surface to be coated no longer meets the requirements SSPC-SP Application of Coating: Unless otherwise shown in the Contract Documents, apply the inorganic zinc primer to all surfaces of H and sheet piles and the exterior surface of pipe piles. Unless otherwise shown in the Contract Documents, apply coal tar-epoxy coatings to the exposed side of sheet piles from the top of the piles to a depth of five feet below the lower of the design ground surface or the design scour depth. Apply the inorganic zinc primer in accordance with this Section. Apply the coal tar-epoxy in accordance with the following specific requirements: (1) Apply the coal tar-epoxy system in two coats. The time interval between the first coat and the second coat will be in strict accordance with the coating manufacturer s published specifications. Apply the first coat to yield a dry film thickness of 8 to 10 mils. Apply the second coat to attain a total dry film thickness of the two coats between 16 and 20 mils. (2) Ensure that no portion of the coating is less than the specified minimum film thicknesses. The total minimum film thickness for any combination of coats will be the sum total of the averages of the specified thickness range of the individual coats. (3) After applying the coating on the steel piles, the Engineer will thoroughly inspect the surfaces and make film thickness measurements at the approximate rate of one for each 25 square feet of area unless deficient thickness is found. In this case, the rate of submeasurements will be increased as required to determine the extent of the deficient area Basis of Payment. No separate payment will be made for coating new structural steel. Include the cost in the cost of the structural steel. SECTION 1081 COATING OF STRUCTURAL STEEL 1081.1 Scope. This specification covers coating new and existing bridges and structures made of structural steel and miscellaneous metals. 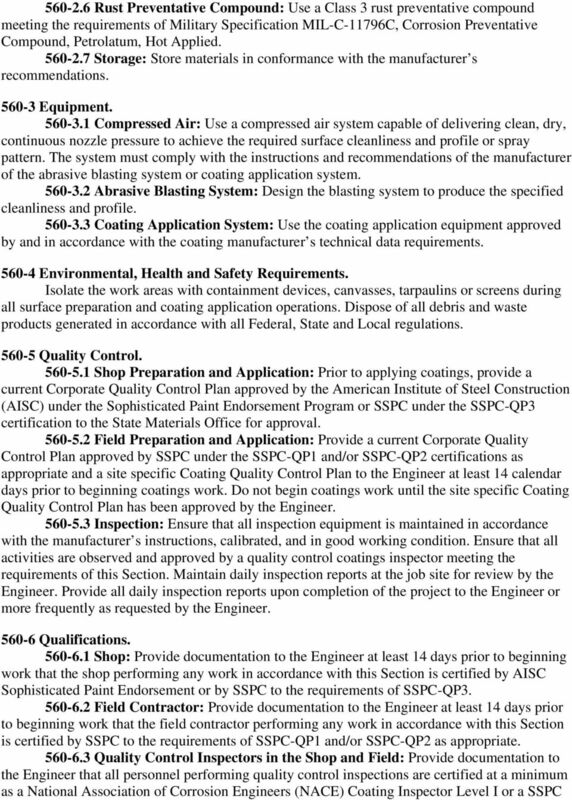 1081.2 Systems of Coatings. A. Extent of steel joists is shown on drawings, including basic layout and type of joists required. 1. Section "Architecturally Exposed Structural Steel Framing" for additional requirements for architecturally exposed structural steel. B. Related Requirements: 1. Division 05 Section Structural Steel Framing for field-welded shear connectors. PART 1. GENERAL 1.01 Requirements: A. Any changes from this standard shall be submitted to and be approved by the Project Manager. William D. Corbett KTA-Tator, Inc.